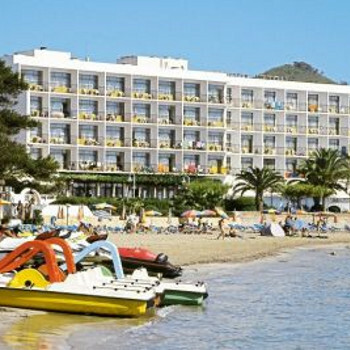 Riomar was a lttle tired and could do with some upgrading but the location must be the best in Santa Eulalia. Booking a sea view room is a must as the views are stunning and as there is no air con the sea breezes helped keep the room manageable in the heat. The Staff were all friendly and efficent. What I did like was that you kept the same dining table throughout the holiday; tables were set to accomodate couples or families. Although you could always find something to eat, it was often luke warm and didn't always look appetizing...my partner said I was just being a snob, but I cannot stand cold food when it should be hot. We had a lovely 2 week holiday and would return to the Riomar. Great location, shame about the food. Stayed at Hotel Riomar 1/8/12. Fabulous position,a stones throw from beach. Large,clean,comfortable room, the balcony overlooked beach. Downside was there was no air con. The breakfast was OK, the evening meals were poor and repetitive with minimum choice. I ate out every evening apart from 1st night. The evening entertainment was very poor. There were no sunbeds around the pool, only chairs and no parasols. There was a small area to side of hotel with beds and umbrellas. This is a small hotel in a wonderful position on the sea front, with a sea view room a must, the sea crashing on the shore can keep you awake though! The breakfasts are the usual bacon and eggs plus beans, tomatoes and so on as well as continental. Occasionally some oddities such as mixed vegetables and mini-pasties! Actually surprising good at 8.00 a.m!! For dinner there is an excellent salad bar, only a couple of choices for the mains, but always something worth eating. The cakes were good as was the ice cream. There was no entertainment at all in mid-May but that wasn't a problem for us. The sunbathing area is on a lower terrace and there were beds for all. The pool is on the main terrace. We have been to this hotel four times over the last seven years and enjoyed it every time - roll on 2013! The Riomar is situated in an excellent spot right on the front. The Hotel is very clean and rooms were done every day with fresh towels. Staff are freindly and speak good English. There is no air con only a fan in the room. There is no TV in the rooms but a coin operated internet computer in the foyer. Despite staying half board the tea/coffee machine was turned off for the evening meal and we were charged for water with our meal! Food quality was so-so but you get what you pay for. During our week stay there was entertainment on our first night only but as the season was drawing to a close there may be more earlier in the year. The pool set up is bizarre with a separate sunbed area on a lower terrace behind the pool, with tables and chairs around the pool. This means if you have younger children you cannot watch them from your sunbed. To sum up: a reasonable hotel to use as a base but don't expect anything flashy. Well what can I say? Fantastic, fantastic, fantastic. Hotel Riomar is very clean - rooms cleaned and towels replaced every day. OK the rooms are not air conditioned but you should know that when you book so please don't moan about it when you are at the hotel! The receptionists especially Lorena are very helpful and it annoyed me when people moaned at them when any problems were not their fault! Bar and restaurant staff very friendly, Apart from the one we got this year but didn't ruin the holiday! Go and try the Riomar for yourself as the hotel is in the best possible location in the resort! I took 2 teenagers and they thoroughly enjoyed it for the 6th year running even though it is a quiet resort. Family run hotel with a family feel. Missing it already! The Riomar is the ideal place to go for a relaxing holiday, The Hotel staff are very friendly the food is very good for a 2 star Hotel,the rooms were cleaned daily and towels were changed every day, I would not take teenagers or young children to this Hotel as I think that they would be bored, there is no entertainment at all but you are welcome to go to other Hotels and watch theirs , the hotel is right on the beach and there are bars and places to eat all along to the other end of the resort where there is a massive marina , there are plenty of shops and the atmosphere is very laid back it is an ideal place for couples.We would visit this Hotel again but not in high season as there is no air con in the rooms and I think it would be too uncomfortable although they do supply you with a big fan. Absoloutely fantastic for a couple of old codgers like ourselves. Right on the beach with a long flat promenade to walk along. Hotel staff brilliant. If you want kids clubs and noisy entertainment then it's not the hotel for you. The Riomar is a nice Hotel, emphasize on the nice. Nice location right on the beach. Nice staff, always smiling & helpful.Nice & clean inside & out. Problem is that they cant cope with the Hotel being full with families. Its not there fault, Thomas Cook have turned 2 bedroom rooms into Family 4 bed to increase profits, thus doubling the amount of people in the Hotel. This then creates a School Dinners traffic jam at mealtimes & a massive amount of bodies around the pool. 1. I would recommend this hotel but not during August for no more than 3 in a room. 2. Read up on hotel, there is no air conditioning & fans are useless in high heat. 4. Entertainment is almost zero at night, in Hotel & at Resort. It was a good holiday, we knew it would be busy, so we were prepared. Unfortunately, the room size & food let it down. I wouldnt go again, but then I dont usually return to the same location twice. This was the second time we have stayed at the Riomar Hotel, again we were not disappointed. The location is the best you could wish for and it is well worth paying the extra to get a sea view. It was lovely to look out in a morning and see the lovely blue sea, looking down off our 4th floor balcony was the palm trees, the sand and then the sea. No traffic and it was so peaceful. The hotel is situated on the quiet side of the pedestrian walk way and there is a lovely walk accross the promanade with cafes along the way, walk the opposite way and there is a river to walk along with plenty of wildlife. The rooms are large and airy, and our room looked like it had just been painted up, the tiled floor was kept immaculate as was the cleanliness of the room and hotel. The bathroom had bath, shower, toilet,bidet, and sink and there was always plenty of hot water. There is air conditioning in the foyer and in the dining room but not in the bedrooms as yet, you are allocated your own table in the dining room and you keep that one for your stay. We couldn't fault the food or the service this is only rated a two star but we have had far worse food in a higher rated hotel, and the dinner plates were always hot. The staff in the hotel were always polite and would do anything for you and there was always a smile be it from the receptionist or the dining room staff. The hotel had a relaxing atmosphere and there was plenty of chairs and tables to sit outside and have coffee. The pool was spotless with a childs section and there are sunbeds in the graveyard area at the side, so called because of the sun worshippers being stretched out!! A pool and games room is also attached to the side of the bar area. Given the location and cleanliness of this hotel I would recommend it to anyone who likes the peace and quiet. Will we bo back again? Certainly in September.